HTTP/2 is the latest version of the HTTP protocol and can provide a significant improvement to the load time of your sites. I wrote a complete article on the subject, which explains the benefits in more detail. In short, there really is no reason not to enable HTTP/2, the only requirement is that the site must also be served over HTTPS. HTTPS is a protocol for secure communication between a server (website) and a client (web browser). It ensures that all data sent between the devices is encrypted, and that only the intended recipient can decrypt it. Without HTTPS any data transmitted will be sent in plain text, allowing anyone who is eavesdropping to read the information. HTTPS is especially important on sites which process credit card information, but has gained widespread adoption over the last couple of years. This is partly due to Google announcing it as a ranking signal, but also due to the introduction of Let’s Encrypt, which provides free SSL certificates. After entering your email address and agreeing to the terms and conditions, you will receive a list of domains for which you can enable HTTPS. Select the appropriate number and hit enter. The Certbot client will automatically generate the new certificate. Now we need to update the Nginx config. The http2 value is all that is needed to enable HTTP/2 support. Save and close the file by hitting CTRL X followed by Y. Before reloading the Nginx configuration, ensure there are no syntax errors. On success, reload the configuration. If you visit your site in the browser using HTTP you should receive an empty response. However, when visiting using HTTPS the site should successfully load and show the green padlock icon in the address bar. If the site times out, ensure that you have opened port 443 on your server firewall! The final step is to update the WordPress address and site URL. Reload Nginx for the changes to take effect, but remember to test the configuration first. Now you should be redirected to HTTPS when visiting the site via HTTP. Although your site is configured to only handle HTTPS traffic it still allows the client to attempt further HTTP connections. Adding the Strict-Transport-Security header to the server response will ensure all future connections enforce HTTPS. This article by Scott Helme gives a more thorough overview. Add the following directive to the http block. You may be wondering why the 301 redirect is still needed if this header automatically enforces HTTPS traffic: unfortunately the header isn’t supported by IE10 and below. Check your Nginx config and reload if successful. 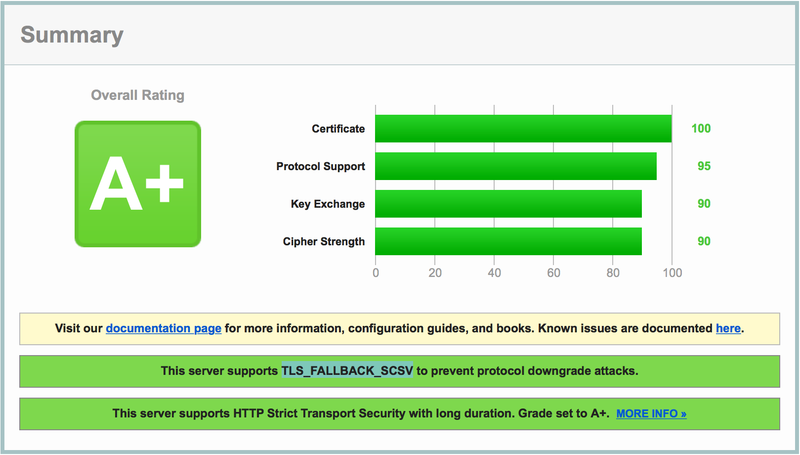 Now if you perform a scan using the Qualys SSL Test tool you should receive a grade A+. Not bad! HTTPS connections are a lot more resource hungry than regular HTTP connections. This is due to the additional handshake procedure required when establishing a connection. However, it’s possible to cache the SSL session parameters, which will avoid the SSL handshake altogether for subsequent connections. Just remember that security is the name of the game, so you want clients to reauthenticate often. A happy medium of 10 minutes is usually a good starting point. Open the main Nginx configuration file. Add the following directives within the http block. Test the Nginx configuration and reload if successful. The final nginx.conf file can be seen below, which includes everything from this series so far. Job done! Hopefully this guide has given you a good insight into securing your sites with HTTPS. Let me know in the comments below if there are any other precautions you take. This entry was tagged WordPress, WordPress Development Tips, Server, Linode, Digital Ocean, Hosting, Linux, Ubuntu, Security, SSL, SPDY, HTTPS, HTTP/2.